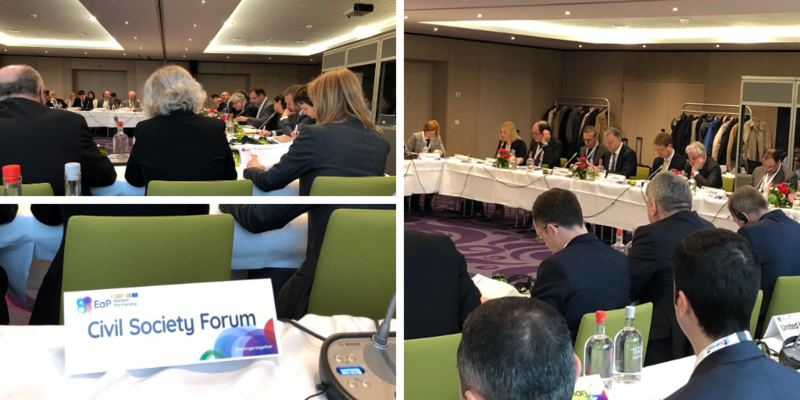 On 11 April 2019, Eastern Partnership Civil Society Forum (EaP CSF) delivered a speech at Senior Official Meeting (SOM) in Brussels – taking account of policy dialogue under Eastern Partnership, and discussing direction for further cooperation after year 2020. Representing EaP CSF, Ina Coseru, Working Group 3 “Environment, Climate Change and Energy Security” Coordinator and Steering Committee member, highlighted the need to make the new agenda “work for the benefit of whole societies” – adopting a more new nuanced approach and stronger regional dimension. Coseru urged attendees to pay close attention to the rule of law in the region. Unfortunately, the example of Moldova shows that the “reform efforts can collapse” – and go into reverse, as we see with the fight against corruption or judiciary reform. Even though 20 Deliverables for 2020 “are a unique regional monitoring, tool pioneered for EaP”, they can and could have been more ambitious in their targets, she argued. What is more, the decision-making, implementation and evaluation processes should be more “inclusive and participatory”, with better involvement of local civil society. Civil society is a “key actor in the reform process” – and should be given more robust support from the EU, especially in times of crisis. In Moldova, many civil society organisations (CSOs) continue to report harassment, which have only intensified in the run-up to recent Parliamentary elections. In Azerbaijan, laying down the framework for legal operation of CSOs remains a serious challenge. There is much to work to be done – across the entire region, in securing far-going, sustainable reforms and equal treatment before the law for all. Coseru ended her speech saying that the civil society is a partner in 10th years anniversary celebrations – and is contributing to the debate by preparing a policy paper on EaP after 2020. It will be presented in time for the main EaP CSF anniversary event, held on 14 May 2019 at the Permanent Representation of the Czech Republic to the EU (back-to-back with the official celebrations, planned for the same day).